I am not an advocate for violence or vengeance, but this would be robber got his just desserts. According to the Sun Times.com, Anthony Miranda, a convicted felon who fails from Chicago, Ill, attempted to steal a parked vehicle on Fri. Dec. 2, 2011, around 11:30 p.m. in the southwest side of the “Windy City.” He asked the driver of the vehicle if he had a lighter. Upon saying no, Miranda then pulled a gun on the unidentified male and demanded money. The driver cooperated, however, he refused to relinquish his vehicle, which is apparently when the situation got really real. This is where I should interject a word of advice to some would muggers: Before walking up to a stranger on the streets in an attempt to rob him or her, make sure he or she is not a trained mixed martial arts (MMA) fighter. Miranda learned the hard way. According to the report, the victim got out of his car and soon attempted to wrestle the gun away from Miranda. During the tussle, Miranda accidentally fired the gun, shooting himself in the ankle. 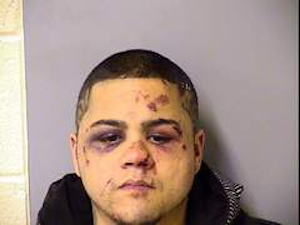 The victim was able to subdue the mugger using his MMA background and hold him down until police arrived. Upon arrival, the mugger was found with a face full of cuts and a couple of matching black eyes. It’s safe to assume he didn’t have a beat up face prior to the incident. Miranda is currently being held on $350,000 bail. No defensive driving course can get Miranda out of this one. Here’s a safe driver resource tip: be aware of your surroundings, if you see suspicious activity leave immediately and report it to police.